​Hurricane Matthew sideswiped Florida’s Atlantic coast Friday, toppling trees onto homes and knocking out power to a million customers, but has spared the most heavily populated stretch of shoreline the catastrophic blow many had feared. 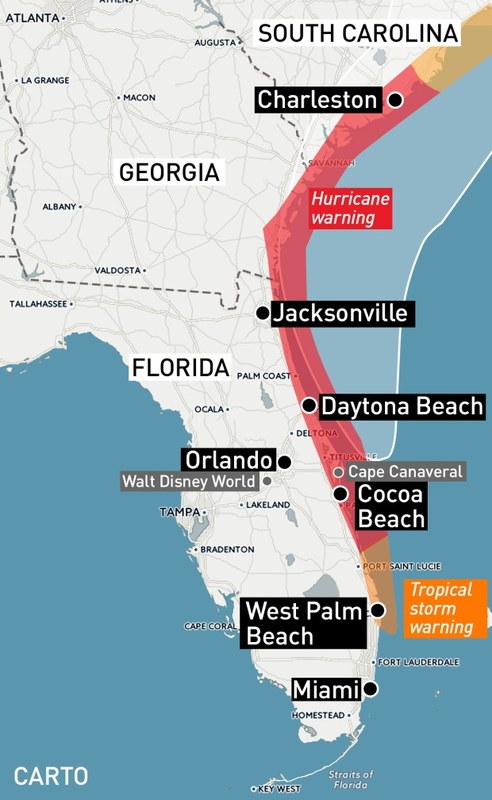 Authorities warned that the danger was far from over, with hundreds of kilometres of coastline in Florida, Georgia and South Carolina still under threat of torrential rain and deadly storm surge as the most powerful hurricane to menace the Atlantic Seaboard in over a decade pushed north. Meanwhile, the magnitude of the devastation inflicted by Matthew as it roared through the Caribbean became ever clearer, with officials in Haiti raising the death toll there to nearly 300, while also cautioning that there were scores of bodies that had yet to be recorded. Reuters is reporting that more than 800 have died. 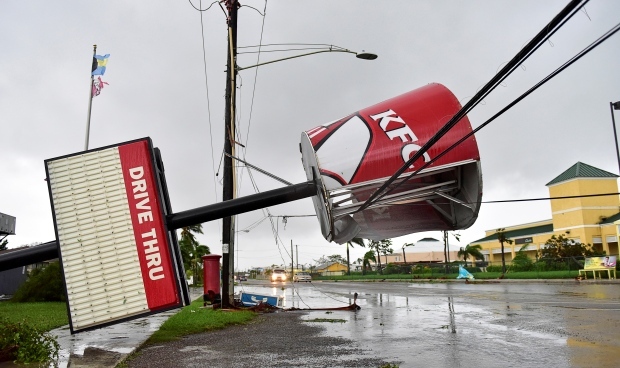 In Florida, Matthew was downgraded to a Category 3 hurricane overnight, and its storm centre, or eye, hung just offshore Friday morning as it moved up the coastline, sparing communities the full force of its 190 km/h winds. Still, it got close enough to knock down trees and power lines, damage buildings and flood streets. Melbourne was hit by wind gusts of up to 170 km/h. In historic St. Augustine, Fla., the downtown district was impassable by noon due to widespread flooding. A giant oak limb had fallen in an old cemetery, and the power started going out in some neighbourhoods as transformers exploded. The city’s mayor, Nancy Shaver, said storm surge there could top 2.5 metres. 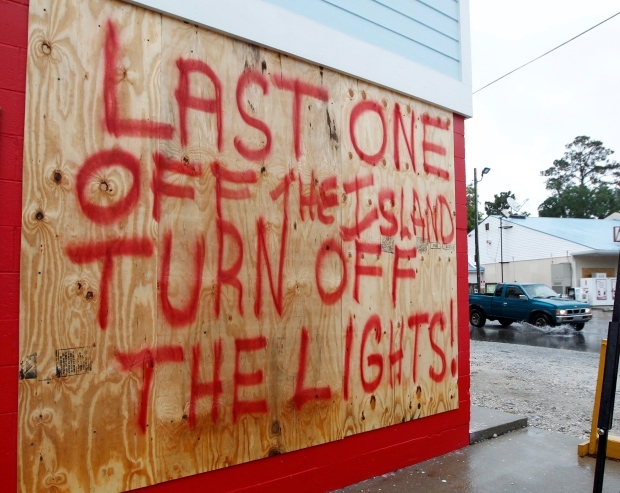 On Georgia’s Tybee Island, where most of the 3,000 residents were evacuated, Jeff Dickey had been holding out hope that the storm might shift and spare his home. As the rain picked up, he decided staying wasn’t worth the risk. But in the morning, there wasn’t much water, his home didn’t appear to have damage on first inspection, and his vehicles were unharmed. As the storm closed in over the past few days, an estimated 2 million people across the Southeast were warned to clear out. Prison officials in Georgia announced that they had moved 1,500 inmates from facilities in coastal counties as the hurricane approached. And several communities are under curfews ahead of the hurricane’s approach. The curfew in Camden County, Ga., begins Friday at 10 p.m. and ends at 6 a.m. on Saturday. County Sheriff Jim Proctor says he’ll decide whether to extend the curfew on a day-to-day basis. Proctor says he hopes a curfew will keep people indoors overnight and prevent injuries. Glynn County, located just north of Camden, announced a midnight to 5 a.m. curfew on Thursday. Glynn County officials have said the curfew will be in place each night of the weekend, ending Monday at 5 a.m. Humans aren’t the only ones hunkering down as Hurricane Matthew batters Florida. A stork has apparently found refuge in a zoo bathroom. 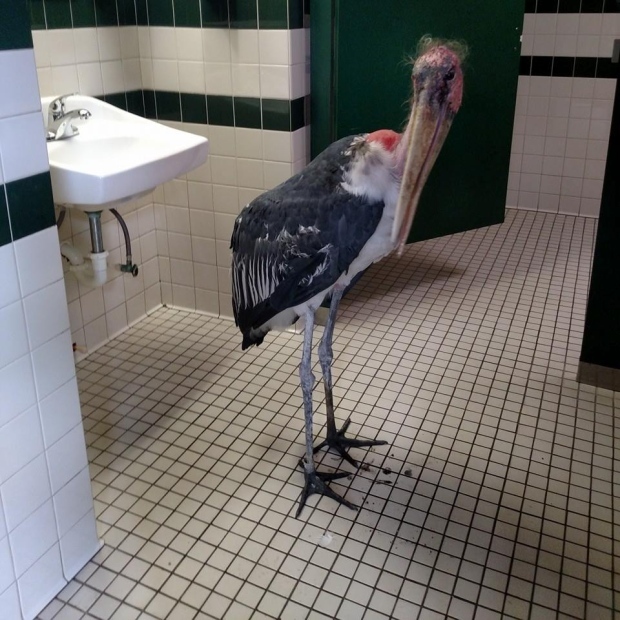 The St. Augustine Alligator Farm and Zoological Park has shared a photo of a marabou stork inside a bathroom at the facility. The zoo’s Facebook page jokes in the caption, “No species discrimination in this bathroom!” — an apparent reference to a law in North Carolina that obligates students to use public school bathrooms conforming to the gender on their birth certificate rather than their gender identity. The stork isn’t the only animal taking cover from the storm. The zoo also shared photos of young alligators swimming indoors in plastic tubs and other birds walking around freely inside a building. The zoo says it has moved all of its birds and mammals inside. In the end, Matthew largely skirted the Miami-Fort Lauderdale-Palm Beach area of over 6 million people and hugged closer to the coast farther north, menacing such cities as Vero Beach, Daytona Beach, Cape Canaveral, St. Augustine and Jacksonville. Farther north, it threatened such historic cities as Savannah, Georgia, and Charleston, South Carolina. At 2 p.m. 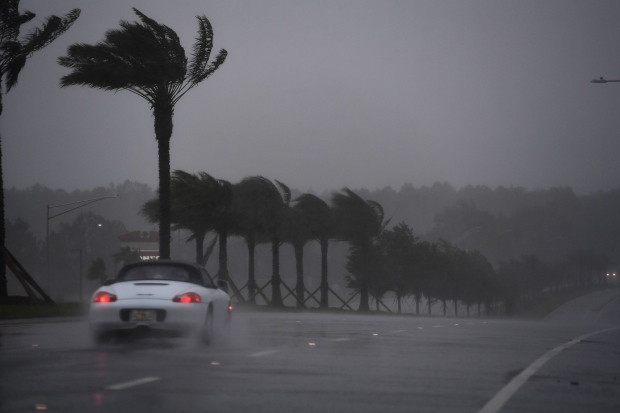 ET, Matthew was centred about 64 kilometres southeast of St. Augustine and about 100 kilometres southeast of Jacksonville. Its winds had dropped to 185 km/h, and it was moving northwest at 19 km/h. 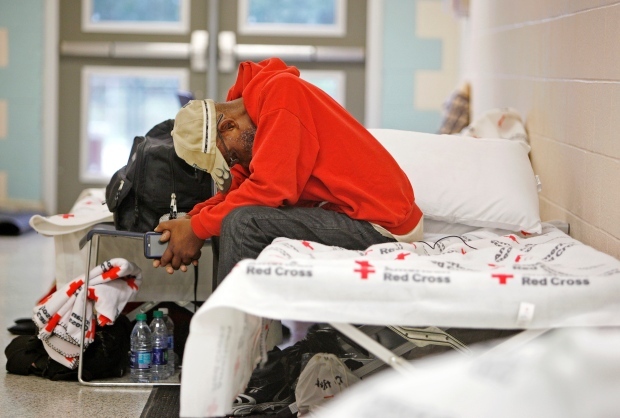 About 500,000 people were told to evacuate the Jacksonville area, and another half-million were under orders to clear out in Georgia. 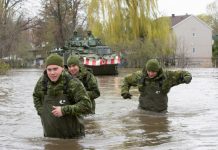 Forecasters said nearly 40 centimetres of rain and a storm surge of up to 2.7 metres were possible in places. National Hurricane Center Director Rick Knabb reminded people in the danger zone that storm surge is the biggest threat to life during a hurricane, even when the eye remains offshore. “If you’re hoping it’s is just going to pass far enough offshore that this isn’t a problem anymore — that is a very, very big mistake that you could make that could cost you your life,” he said. Airlines cancelled at least 4,500 flights Wednesday through Saturday, including many in and out of Orlando, where all three of the resort city’s world-famous theme parks — Walt Disney World, Universal Studios and SeaWorld — closed because of the storm. Airports in South Florida began returning to normal, however, with American Airlines seeing its first arrival at its Miami hub at 9:05 a.m. Despite the warnings to leave, many hunkered down Thursday night and hoped for the best. The door to Darrell Etheridge’s garage was blown off, but the Vero Beach resident said the storm was no big deal. There was no flooding and he had power for most of the night, only losing cable TV. Sheriff’s spokesman Gary Davidson said at least four callers reported trees falling onto their homes in the Daytona Beach area. No injuries were reported. 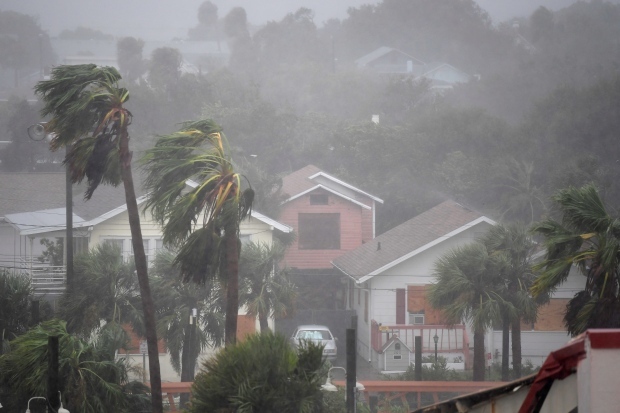 Some people who refused to evacuate were stranded and called for help but were told to stay put until conditions improved enough for paramedics and firefighters to get to them, said emergency operations spokesman David Waters in Brevard County, the home of Cape Canaveral. “A family called in that the roof just flew off their home on Merritt Island,” Waters said. NASA reported mostly minor damage at the Kennedy Space Center in Cape Canaveral, including damage to some parked cars and an office building roof.